Archives of Eaton Bray News for November 2005. This article was published in November 2005. Please see Latest News for more recent information. 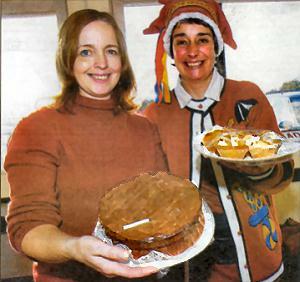 A Christmas Fayre at St Mary's Church, Eaton Bray, raised £990 towards the church restoration fund. Church spokesman, Kevin Eagling, said: "The Christmas Fayre was a great success and we hope it can once again become a regular fixture in our calendar. We'd like to thank everyone who came along and we hope they all enjoyed it. "St Mary's is currently home to a scaffolding tower as we've discovered that the roof needs further repair work, in addition to that carried out earlier in the year. We also raised £167 for Emmaus, the homeless charity that we have been supporting throughout the year and a further £ 170 on the Traidcraft Stall." This article was written in 2005. For up to date information about the Society, see the Eaton Bray Cinema - Focus On Film Society pages. Following on from the previous screenings, including this month's "Love Actually", the Eaton Bray Cinema will be continuing over the coming months with various films from recent years showing in Eaton Bray Village Hall. Please continue to support this new venture to increase the range of social activities within the villages. In search of a chocolate tombola? A Christmas fair will be held at St Mary's Church in Eaton Bray on Saturday (19th) from noon until 2pm. Visitors can browse around lots of stalls, selling items including toys, handicrafts, home-made goods, cakes and gifts. There will be a chocolate tombola, and a raffle will also be held. Refreshments available, including a chance to tuck into a ploughman's lunch. The event will raise funds for the church. Admission 50p. It was a case of lights, camera, action at Eaton Bray Lower School when Anglia TV visited to show pupils the glamorous world of television. Thanks to one of the dads, Steve Corkett, the children had the opportunity to check out the technology in action and see how broadcasts are made. Mr Corkett, also took along sports reporter Linda O'Brien to show them how a real presenter works. The children were videod making broadcasts and they could then see themselves in action when it was played back. The school was sent a video of the final pieces for the pupils to watch in class. School secretary Liz Constable said: "The children had a wonderful time, they loved watching themselves back on the tape. I'm not sure if we will have any future presenters in our midst though!" The next film to be screened in the Village Hall is "Love Actually" - tomorrow (Monday 14th 2005) at 2.00pm. Admission is £3.50. Please support this new venture to increase the range of social activities within the villages. Sporty types in South Beds are being urged to find out at a special forum how Beds Active Sports could help them develop. The Beds and Luton Active Sport Club and Coach Development Forum will take place at Vandyke Upper School, Leighton Buzzard for coaches and clubs. The forum will focus on how to gain funding, volunteer opportunities, school-club links and mentoring. National governing bodies, the council's sports development officer and school sports partnership representatives will also be on hand to answer questions. By attending the forum, clubs and coaches will be registered as an 'active sports club' and will be eligible to sign up for active sports courses for free. Sports development officer at South Bedfordshire District Council, Chris Bolton, said: "I urge all local sports groups and coaches to attend this forum. "It will provide lots of useful information and could be just what they are looking for to develop their services." The forum starts at 7.30pm on Thursday, November 17. For more information about the forums log on to the www.bedsactivesports.com website. Since the launch of this Eaton Bray News and Information website, the design of the site has been a mix of that used for St Mary's Village Carnival, along with some tweaks here and there to give it some uniqueness. Over the weekend, the site has been redeveloped with ideas from various places, to hopefully give a much more appealing look and feel. Please leave a comment to let us know what you think. Over the next few months, this site will be developed on to make it more of a community site where everyone can participate, so if you have any more ideas for where things should go, please leave a comment or contact us directly. Also, if you have anything you wish to send us in terms of pictures, articles, or anything you think would be of interest, you can use the Submit Content facility which is always available by clicking the [email protected] link at the top of the side panel. Where do you think you're ghouling with that pumpkin lantern? There is no need to be a witch or wizard to turn your pumpkins green now Hallowe'en is over. The scary lanterns can be recycled in a home compost bin of wormery once the festivities are over. This top tip is just one among many released by Beds County Council, which is reminding residents how much waste can be produced over party periods. Making a costume out of unwanted textiles, eg an old sheet for a ghost outfit. Reusing glass jars as candle holders. Saving novelty Hallowe'en gifts to reuse next year. Taking empty wine and beer bottles to your local recycling centre or leaving them for kerbside collection. Using a peat-free compost to grow next year's pumpkins or make your own using the seeds from this year's leftover lanterns. To buy a home compost bin or a wormery, call South Beds District Council on 08451 306090. An interesting Advent idea in the November edition of Focus, the parish mad for Eaton Bray, Edlesborough, Northall and Dagnall, caught my eye. Apparently, there's an old Mexican custom that in Advent, people dressed as Mary and Joseph travel around their villages knocking on people's doors to see who will offer them hospitality. Last year, the Mother's Union adapted the custom for a travelling crib idea in villages near Dunstable, which will be run again this year. The plan is that Mary and Joseph crib figures, carved from olive wood by Christians in Bethlehem, spend a night in local homes willing to offer them a welcome. A short service is held on their arrival, and a candle is lit to signify that they have a home for the night. They return to church on Christmas Eve for the Candle Service. A form has been put up on the notice-board in St Mary's Church, Eaton Bray so that people can sign up if they want to offer a home for a night for the travelling crib. If they have more offers of hospitality than the number of Advent days, they will be looking at providing homes for the Three Wise Men. At a time when we're all dashing around madly present-buying, what a lovely way to remind everyone about the true meaning of Christmas. You are viewing the November 2005 archive.